Garlic has been used in many parts of the world throughout history to add flavor to food. Many cultures of the past understood the healing properties of the bulb, which is known to act as a mild antibiotic, antiviral and antifungal agent. Garlic also has many anti-inflammatory properties. This is because garlic helps to reduce the level of an amino acid called homocysteine, a byproduct of the breakdown of protein by the metabolism, which causes inflammation and damages blood vessels. Garlic is a good source of vitamin B6, needed to maintain normal nerve function and healthy blood, and vitamin C, which is essential for building connective tissue and helps wounds to heal. Garlic is also a good source of trace elements such as copper, which helps build red and white blood cells, and manganese, which aids enzyme function. The minerals phosphorus and calcium, which both play a role in building healthy bones and teeth, are also found in garlic. That’s not all – garlic also contains sulfur and allicin, naturally occurring antioxidants that may help to improve hearth health and lower blood pressure. However, not all forms of garlic are created equal. 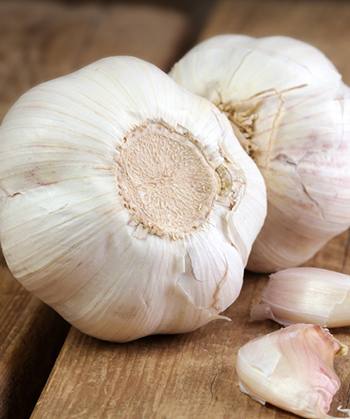 Fresh garlic contains far more healthy properties than garlic that has been processed into powder, flakes or a paste. Exposing garlic to heat for long periods of time also reduces the effectiveness its healthy properties, so it’s best to add it late in the cookingprocess. Alternatively, mince raw garlic and add it to salads to temper its strong flavor while still enjoying the maximum health benefits of the bulb.